To bring home a sense of warmth and make it more inviting, homeowners do consider kitchen remodeling. In the entire home, a kitchen is the most important room. Being the major hub in the home, the kitchen facilitates day-to-day living. It may be said that the days of homeowners start from the kitchen and end in the kitchen. Kitchen remodeling can pave the way for a healthy and happy family. You may attain a kitchen of dreams if you opt for kitchen remodeling. 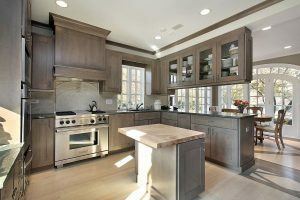 Kitchen remodeling can add to the functionality of the kitchen. You may add walk-in-pantry, create room or space for printer and computer, and re-design the countertop to complement the lifestyle. You may open up the kitchen to adjoining rooms and promote interaction. Create a new island to enjoy early morning chats. Kitchen remodeling can also reduce the risk of accident while making the room safer. The height of the countertop may be modified to reduce the back strain. Try and use eco-friendly materials to improve the indoor air quality. A modern kitchen makes use of natural gas or electricity. Every kitchen in the western world is a modern kitchen. The modern kitchen offers a lot of conveniences to the users. In fact, the benefit of such a kitchen may be enjoyed in everyday life. The moment you think of modern kitchen, you are reminded of sleek design, state-of-the-art technology. If you are looking to create a modern kitchen, here are some outstanding ideas to doing that. 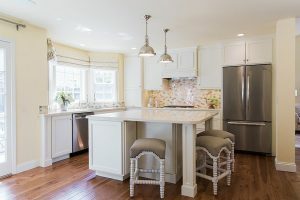 The modern kitchen is intertwined with the word ‘technology.’ If you wish for a technologically advanced kitchen, you may focus on computers or computer chipped appliances. Nowadays, modern kitchen appliances make use of computers to set the temperature, food expiry date, set the timer and set alerts about inventory restocking. You may include as many modern appliances as possible. Include a flat-screen TV to entertain the family. You can have a TV to display the food recipes, health tips, prepare household schedules, and use family calendars. You will enjoy the cooking sessions if you include such elements in the kitchen. Try and embrace classic design ideas, state-of-the-art technology, bold colors, and modern countertops. By doing so, you can make the modern kitchen warm, inviting and technologically advanced. Modern kitchen cabinets may be simple or luxurious. 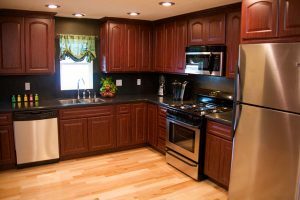 Traditional style cabinets lacked featured and functionality. Most of the modern cabinets shaped as rectangle or square lack the fancy doors. A lot many appliances can be included in the modern kitchen to make it stylish, beautiful and functional.